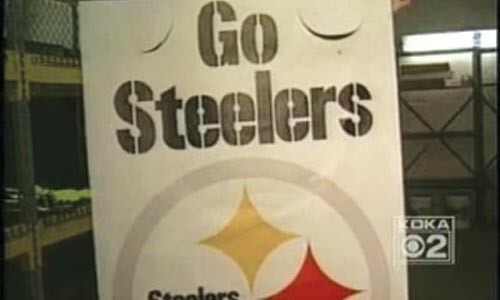 Summary: The unthinkable has happened: Several Steelers banners have been stolen! 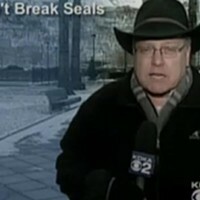 Reporter: Marty Griffin, KDKA Channel 2 Airtime: 2 minutes, 21 seconds on March 13 Visuals: * Assorted angles from deep within the recesses of the City's Public Works garage, where the alleged "banner heist" occurred. Highlights: * When anchor Stacy Smith announces, "Last week, fans raced to be among the lucky few to purchase a piece of Steelers history. But some of them will not be getting that Super Bowl banner they wanted. They were stolen -- right out of the City's Public Works garage." * When Griffin echoes, "Yeah, all over the city, employees are calling this ridiculous, saying it gives them all a bad name. Eleven of the banners have been stolen. They're pretty big banners. Public Works Director Guy Costa [is] really angry about this, saying it's a stupid act by a couple of stupid employees. And he promises they will be caught and prosecuted." * When Griffin reports, "This is the coveted banner. There's only one or two left. There were 50 to start with. Five were stolen right off the poles Downtown. And then 11 were stolen from here, in the basement of the Public Works building." * When he adds these details: "They were covered up, they were behind this locked fence. They were behind another locked door. In other words, this banner heist was an inside job." * When Costa explains, "There's a lot of people that have keys to this particular building. ... The question is, how did they get in there? We do have limited access to this building, we do have key files, we do have a record of everyone who's entered this building for the past month, so we're reviewing those records right now." * When Griffin emphasizes, "The City was trying to do something nice. ... The City decided to take [the banners] down, selling them at cost for $150, and fans snatched them up fast. In fact, they're already increasing in value. Here's one on eBay selling for more than $200, with a promise that it wasn't stolen. eBay is one of the places investigators will look." * Griffin adds: "By the way, [Costa] believes they were stolen in the last two or three days. He also wants you to know you can call the city's 311 line." What We Learned: It was a banner year for the Steelers -- and for some thieves as well. Unanswered Question: Never mind the garage -- how did thieves get away with taking banners from Downtown poles? News Value: 9. A typical Griffinesque report (does the man take breaths between sentences? ), but disturbing nonetheless. You get 'em, Guy!